LATV Network - the original national, bicultural television network - is making history as it launches its new, groundbreaking weekly talkshow, Glitterbomb, set to premiere this fall. According to press materials, Glitterbomb is “an explosive pop-culture talk show hosted by an entirely gay, Latino, Hollywood-insider panel featuring "Entertainment Weekly" senior editor Patrick Gomez, actor Enrique Sapene and iHeartRadio personality Alexander Rodriguez." Combining experience from the worlds of radio, acting and journalism, the English-language show will offer insight into A-lister life from a decidedly queer Latino perspective. With a festive and unique flavor, the show promises no subject will be too hot to handle and no scandal too spicy to dig into. Produced at LATV’s state-of-the-art HD studios in Los Angeles, Glitterbomb plans to offer the latest in pop culture news and trends; insider looks at the latest celebrity hot spots and events; as well as some of the biggest names in entertainment. LATV is the only remaining Latino-owned TV network in the Hispanic television space. 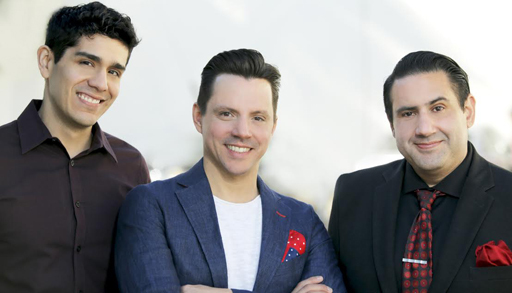 Its programming primarily targets U.S.-born Latinos and the coveted bicultural 18-49 Latino demographic, with content that features originally-produced shows in Los Angeles, as well as licensed content that has never before been seen in the U.S.
For more go to www.LATV.com.